Been rather busy for the past couple of weeks…nothing monumental, just lots of stuff that’s been keeping me occupied. My parents and I did a massive garage consolidation and reorganization over the past two weekends. It looks great, really organized and easy to find stuff now…I need to put a few finishing touches on some of the drawers where I store most of the horse stuff, but for now, it’s out of sight-out of mind…mostly. We’re official now! The orange is Renegade’s signature color, so we felt it only appropriate that my pony be sporting that color on her boots. I’ve grown really fond of the orange, and it even looks good with our existing purple color scheme. After all, purple/orange has worked for the Phoenix Suns for years. Could we be any more matchy-matchy? Mimi has decided that June is her favorite month this year…she’s feeling very good, flirting with everything that has four legs and hooves. *sigh* Her hormones didn’t get the memo that she’s 19. 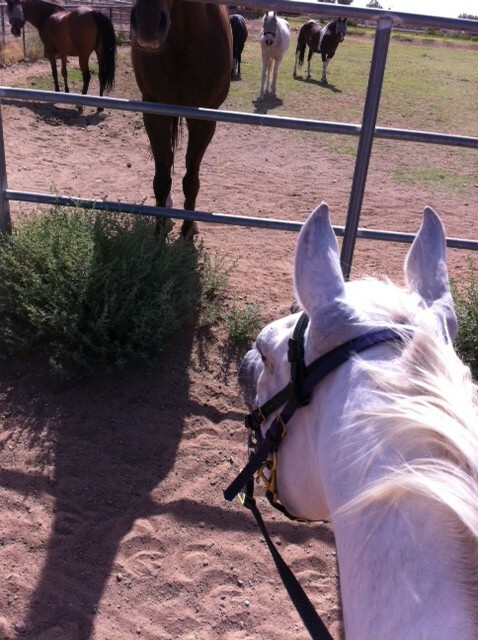 She got a really good workout this morning, breaking in her new boots with an hour in the sand arena. 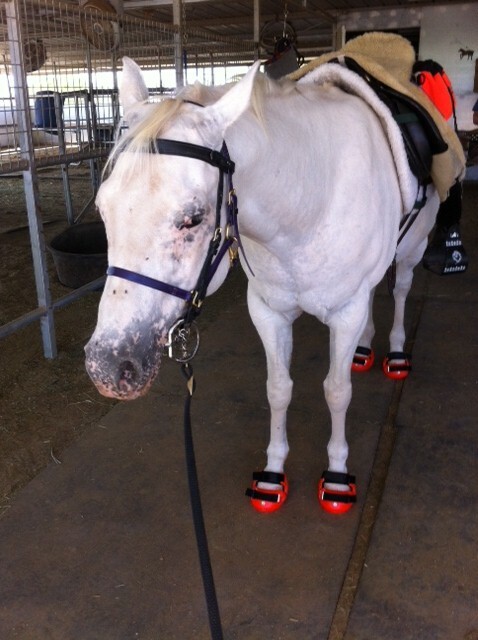 We definitely put them to the test, messing with the fit of the hind boots. She’s technically a size 000, her hind feet are so tiny. 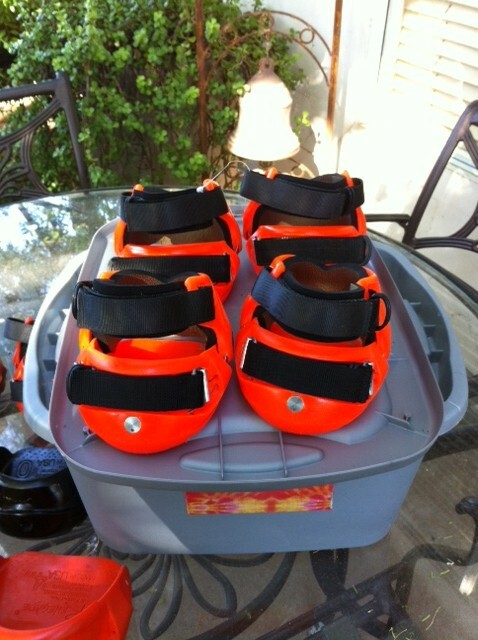 But we’ve always been able to jerry-rig the 00 boots to fit, thanks to doing some custom shims in the sides. The only catch? I always got my new boots at rides, where Kirt was on hand to be able to do the shims right then and there for me. Since I’m not going to rides with the pony anymore, that sort of takes away that option. However, it’s also one of those little tricks I need to learn to do anyway, so I’ll probably be messing with that in short order. Once I do, I’ll definitely get pictures and post about it, since it’s bound to be a novel experience. Really not sure what else I might have missed…like I said, staying busy and trying to duck the worst of the summer heart. It’s officially monsoon season now, which brings at least the hope of afternoon monsoon storms. Endurance is definitely the place for those that love bright colors! 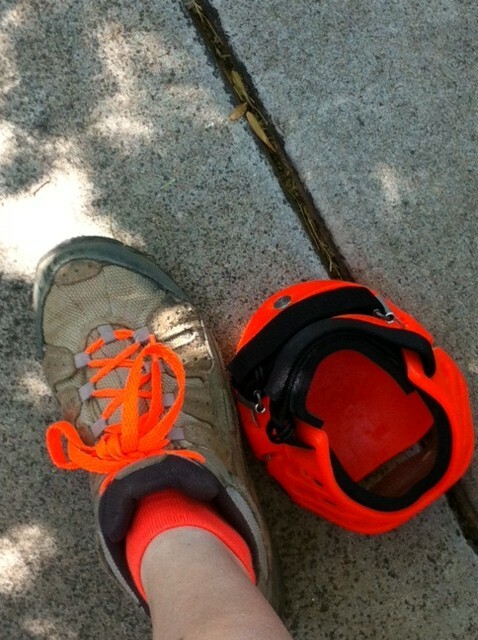 I love the orange…they are so distinctive! Me too. That's the color I used on my mare Dazzby. Hmmm, I might just put them on her and take her out for a spin on the trail (she had to retire from distance riding last year due to arthritis). They look great on your mare! Love the boots! My hubby is ordering the orange also. We think it looks good with our grey horses. Thanks for sending Courtney our way. She is awesome. We have changed up our guys' diet and added some new supplements. Sorry I didn't get back to you sooner…we've had a few emergencies here. ugh. Thanks again for your help! Excellent, I'm glad Courtney is working out and you're loving the boots! Keep me updated on how the barefoot transition is working and if you need any help with the boots.